The thunderstorms passed by quickly, leaving a few large drops of rain in their wake and some empty threats of weather violence. We have fared far better than our neighbors in the American West, those unfortunate victims of extreme tornados who still struggle to recover their lives. Even as I grieve for them, I celebrate my own small corner of land in the foothills of western Pennsylvania. Tonight, the garden in twilight is luxuriating in its richness of leaf and flower and I cannot end my stroll. It is bewitching. Leaves of every shape and form spring out and blend – all of the plants in my garden touch and jostle each other – no Puritan “touch me not” unplanted spaces here! Oh, this is an excess of green and growing that sings a great chorus in the dusk of a warm early summer day. Yes, many plants bloom in May – the insignia of iris, the globes of allium, the stars of clematis, the blooms of columbine, lilac and others. But May is feckless in its headlong plunge into green growth from the carpet beneath one’s feet to the canopy among the trees. May is fragrant and headstrong, the vibrant green path leading and spilling us into June. 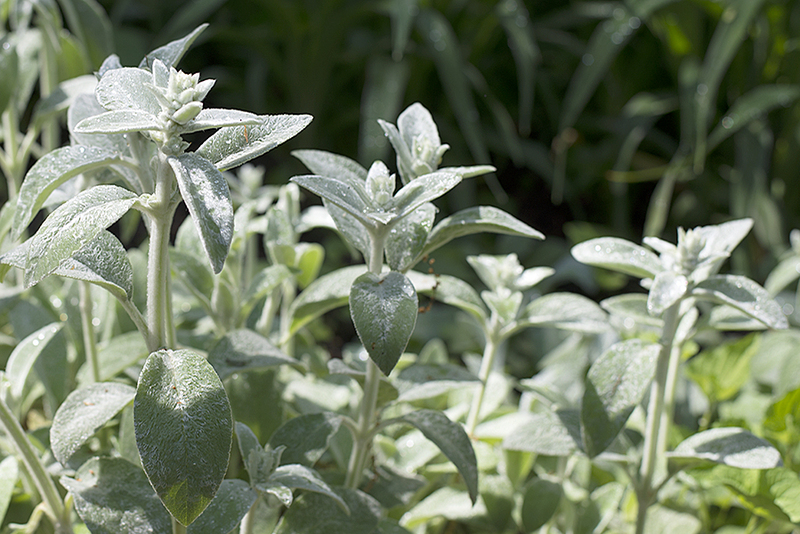 The silver lamb’s ear have risen to a foot high impossibility in the past few days, ready to bloom and nourish the bees –their bright foliage outlines the beds in the garden. The swords of daylily leaves create circular swirls of green blades, predicting their July bloom – a promise of color and form to come. Beauty bush and lilac burst with thousands of tiny flowers, mounds of color and scent that greet the morning and bless the warmth of the evening, alive with the buzzing of bees seeking nectar. And so it goes. May is so full of voluptuous beauty and scented flowers that it sends the senses reeling with the experience of it, making us mad with joy. 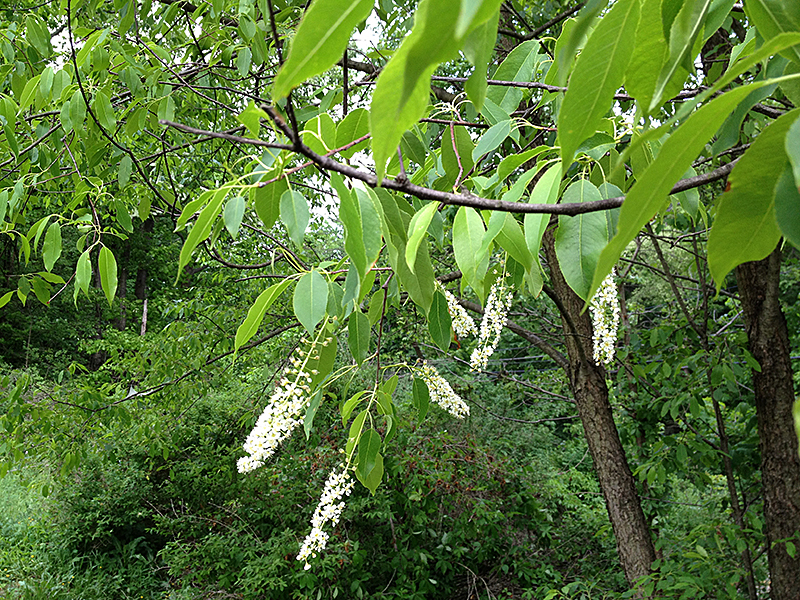 To see more photos and read more about the fragrant wild black cherry that is native to the eastern US, see Bernadette’s post Wild Black Cherry. This entry was posted in Flowers, Garden and tagged beauty, flower photography, flowers, garden photography, gardening, May, May flowers, scent in the garden by composerinthegarden. Bookmark the permalink. Thanks for that Murdoch quote but mostly I love your adoration of floral and green growing beauties…and the sharing of your personal gardens. Thank you! I am so glad I found your blog! Your gardens and photographs are beautiful! Thank you Ellen; I’m delighted to see what you are doing in the garden too! Thank you for visiting and commenting, Merrill; I love learning more about the native trees in my area! We know it here both by the Latin name and as Wild Black Cherry – it grows all throughout our woodlands and parks, usually on the edges where it can get some sun. I hope you will accept the following award below. It is offered in appreciation of all your inspiring works. Please keep inspiring all of us! Mary, thank you so much; I am honored! What a wonderful essay and a great collection of photographs- you’ve caught the season well! Thanks, Tracy – glad you enjoyed! What an incredibly beautiful post! I love that quote by Iris Murdoch, and I, too, have been visiting the garden daily, shocked at what it can accomplish in practically no time at all. We humans should be so diligent in our daily life, sprouting new leaves and roots and flowering when conditions are best. And thank you for adding my wild black cherry! Thanks for stopping by, Bernadette; I was thrilled to add a link to your post – perfect timing! Love the quote about being mad with joy from having flowers in our midst. I feel that way every morning when I sit with my coffee in the midst of my tropical flowers. Was excited to see you had Lantanas–especially the multi-color ones. I’m surprised they can be planted so early in PA. We usually don’t get them in the garden center until it is super hot–mid-June or so. You did an outstanding job this year, as always. Everything is so lovely. Enjoy! Thank you, Eleanor. Yes, I can imagine you sitting among your flowers in the morning; must be especially relaxing now that you are retired! Love lantanas – great colors and they do handle the summer heat with aplomb. A piece of paradise’s bliss. Of serenity and bright new beginnings. Nature ‘s blessings so beautiful and radiant. Dear Island Traveler. thank you for stopping by and commenting! I agree, it is a piece of paradise and a true blessing. A great, great quote from iris Murdoch – I remember enjoying reading her in High School, or maybe a bit later. As for the flowers themselves…we must all bow deeply to them. May’s “headlong plunge into green growth” – and “I can only hold on tight and try my best to serve the beauty of the garden as I am flung and swung through its spurt” – that’s as good as Iris! 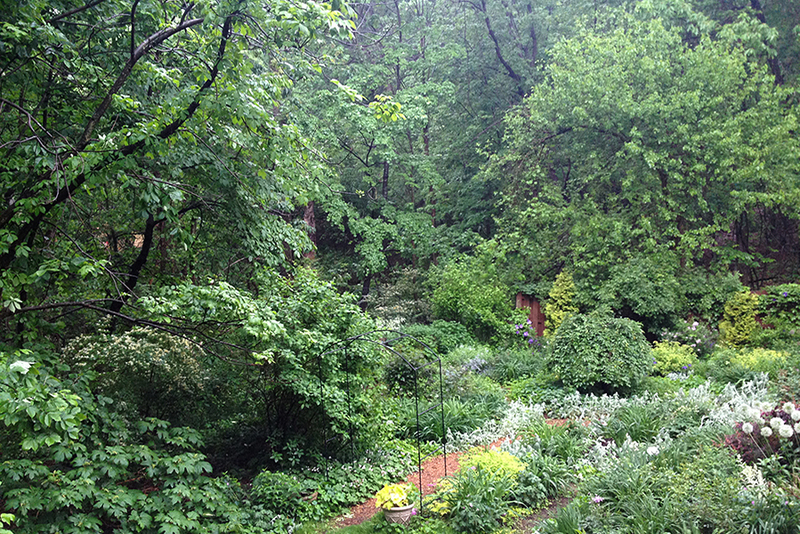 A lovely tour…Beverly Sills, Immortality, the woodland with its hostas, the purple clematis…delicious. Thank you. Oh bluebrightly, so glad you enjoyed the post and you have humbled me with your Iris Murdoch comparison. I love this time of the year in the garden, and treasure your comments. I love it, too. It shows! I’m glad you can balance work & the garden well enough to share with us. Having a hard time myself with the balance these days, but some times are like that and I know it will get better. Lovely pictures to go with lovely words. Thank you, Chris; hope your spring is beautiful! Life in the hood, well your hood. If only this would take over the earth. If only more would pick up a spade to plant then to burry. Am a dreamer. Outstanding …. great captures of nature at work. Your clematis are ahead of ours … but we could have a blanket of blooms very soon! Good of you to bring us that quotation from Iris Murdoch. I guess that makes her an honorary Texan. Goodness, only 6 AM and I’m drunk on your words and images…wonderfully so. Thank you for the glorious beginning to my day…which will be spent in the garden. 🙂 Blessings on your week’s end, Lynn! Kitty, nice to know I helped to start your day with a garden carouse! Enjoy your weekend – sunshine seems to have returned. a journey in words and images!! Beautiful Lynn!! You expressed your thoughts brilliantly, Lynn, both visually and in prose. Thank you, Kerry! I got to try out some of my rental lenses which gave me a whole new perspective. More on that in a later post. Darylann, thank you for your comment. Oddly enough, one of my goals this year is to find a way to match my images from the camera to the images in my head – not an easy task. And I will say hello to the clematis for you; several more are about to burst open this weekend. For me, the written word should carry the most weight, as it has here, and quite eloquently. The images should support but not be equal to the precious written word, in which we, as reader, are so wrapped. Our imaginations, tickled again, through your very lovely images. I suppose I’m saying that what I feel about your experience, can’t be expressed in a photograph. I am not demeaning the images, they are quite lovely. Glad to know that the smell of green can cross the pond, Claire 🙂 Thanks for visiting! Love that Iris Murdoch quote…and, of course, the Iris photos! A lovely riot of colours, indeed. I shuddered at the Lantana camara, though. It is a banned and invasive species here, and I have to wage war on it as with Mirabilis jalapa. Such a pity, because both are so prolific and pretty. Thank you , Colonialist. What a shame about the lantana; it is an annual for us and much too tender to be a problem but we have our share of invasive plants here as well. As the seasons continue to warm, plants that were never a problem here are starting to sow about and become a nuisance. The gardener’s dilemma is always to make hard decisions between temporary beauty and the preservation of the local environment. So complicated.